Emulators usually move as slow as trying to run through a swamp, so kudos to the brave warrior who has taken some time to load the Windows Phone Mango update SDK, and toy around with the navigational features in the emulator. We already know that Nokia Maps won't be making it directly in Windows Phone devices with Mango, but will rather appear at a later time, when the daunting task of converging Bing and Nokia maps over the underlying Navteq cartography is finished. So free turn-by-turn navigation will be on WP handsets courtesy of Bing Maps only for now, that is why it's interesting to see how it behaves. For now Bing doesn't cover nearly as many countries as Nokia Maps with detailed routes, not to mention offline availability and voice guidance, but, until the update hits, that might be changing. Still, for now Symbian will remain the king of free offline navigation, courtesy of Nokia's Navteq purchase a few years ago. Have a look at what navigating with a Windows Phone will feel like on a Mango-ified handset. lolol this is soooooo weak compared to Google Navigation on Android!! Are you serious?!? Have you never used Google Nav?!? How about 3D view, many different layers such as satellite, traffic, places, latitude, and street view! Simply put no 3d= fail. How could you not notice that when driving? Making good strides... WP7 is turning into a well featured OS! About the interface, for instance, I use TomTom and I immediately disabled the 3D view. I find plane view much better (even though less cool) while driving. 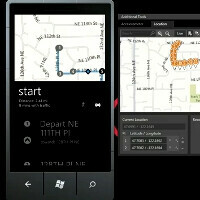 I am afraid they will drop this project, since they will use Nokia Maps. My wife has Nokia maps and the routing algorithm is terrible! TomTom always finds better routes. In terms of routing, I don't know about Bing, but I can definitely say TomTom > Google maps > Nokia maps. If Bing is comparable to Google, switching to Nokia maps will mean worse routing (that is definitely more important than any other feature).